In almost all countries, one of the main goals of e-Strategies has been to enable the provision of interactive online services. The development of new technologies, using Web 2.0 technology, is transforming the delivery of public sector services and better meeting citizens’ expectations. Web 2.0 applications have brought about a dramatic change in the role played by users, who can now participate much more proactively in the field of service delivery by the public sector. The European Union in general and Spain’s public administration in particular are formulating public policies and legal frameworks to introduce Web 2.0 technologies into the area of public sector service delivery, in order to personalize and to improve access to and the quality of public sector services. This chapter gives an overview of public policies and legal frameworks at a regional public administration level in Spain, analyzing how regional governments are applying these policies to the provision of public sector services. Our fundamental aim is to present the current state of the introduction and use of Web 2.0 technologies in the public sector in Spain. In addition, we analyze the main determinants of the use of Web 2.0. tools in this respect, and investigate the particularities of Web 2.0 administration as a new strategy for innovation in the management of public sector services, in terms of improving efficiency and the capacity for interaction between citizens and the administration, in a framework of ongoing modernization of the public sector in Spain. 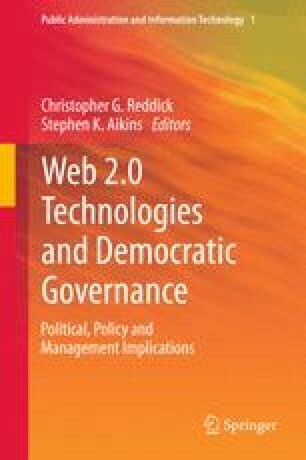 The research reported in this chapter has been supported by the Andalusia Regional Government through the excellence project “Improving the management, transparency and participation in Local Governments through The Web 1.0 and Web 2.0” (P10-SEJ-06628). TNS Emor (2010). Konadike rahulolu riigi poolt pakutavate e-teenustega. Available at http://www.riso.ee/et/files/kodanike_ rahulolu_avalike_eteenustega_2010.pdf.